Racin’ Today » Woody: Has Jimmie’s Magic Ride Ended? Woody: Has Jimmie’s Magic Ride Ended? As soon as it happened I thought to myself: this could be a seminal moment in Jimmie Johnson’s amazing four-year run. 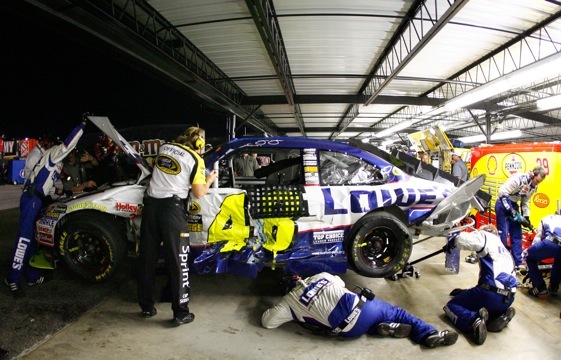 Johnson was cruising around Darlington Raceway last Saturday night, minding his own business and staying out of trouble – as he usually does – when suddenly A. J. Allmendinger lost control, zinged up the track, and nailed Johnson’s Chevy. Jimmie was OK but his car was demolished and out of the race. How many times in the past four years have we seen Johnson avoid similar accidents by a hair? In the past Allmendinger’s skidding car would have hit inches in front of Johnson. Or inches behind him. And the announcers would have whooped about “another close call” for Jimmie. But not this time. This time Jimmie was in precisely the wrong place at precisely the wrong time. The Darlington wipeout came amid a dismal (by his standards) streak. It was his third DNF in 11 races this year. Johnson is used to running entire seasons without that many DNFs. And so the question: Has his incredible luck finally run out? Frankly, I don’t believe in luck, good or bad. Or fate. Or whatever you want to call it. But I do believe in odds – and Jimmie has been defying them for four years. The odds are that if a driver keeps running races and logging laps, eventually he’s going to run into trouble. You can’t keep rolling around in the grass without eventually getting chiggers. That’s what make Jimmie’s four consecutive championships so remarkable. To his credit, he did a great job of driving and team gave him reliable cars and efficient service. But he also benefited from some amazingly good fortune, dodging disaster and defying the odds time after time. Eventually the odds catch up to us all. It’s like tossing a penny – you may win one, two, three or even four tosses in a row, but eventually you’re going to call heads and it turns up tails. This could be the year that Jimmie’s penny comes up tails. Johnson has stretched his odds to the breaking point, avoiding on-track trouble and mechanical breakdowns that are a routine part of the sport. Other great drivers and strong teams couldn’t match Jimmie’s combination of good driving, good cars and good fortune in getting through NASCAR minefields week after week. I won’t count him out yet – I’ve made that mistake before, only to see him make an incredible comeback – but it’s safe to say that Jimmie suddenly no longer seems bullet-proof. Trouble that once passed him by has stopped to knock at his door. When trouble starts, it tends to compound itself. When a driver or a team thinks they’re unbeatable, they often are. They race with confidence, which means that they race better. When that confidence crumbles and they start wondering and worrying and looking over their shoulder, the problems tend to compound. Jimmie won’t admit it, but you can bet his confidence is bruised right now. He’s lost the points lead, he’s struggling to finish races, and he’s experiencing the same kind of headaches and misfortunes that normal racers encounter. This is something new for Johnson and his team. It’ll be interesting to see if they can weather it and once again overcome the odds, or are we seeing the beginning of the end of the four-year reign?